Tours run regularly throughout the day – See each booking company for available time slots. Visit off-season or first thing in the morning to enjoy the Royal Palace almost to yourself. We are comparing Royal Palace of Madrid Skip-the-Line Tour Prices from leading ticket suppliers and Try to find you Cheap tickets prices on the market. The Royal Palace of Madrid is one of the city's top tourist attractions. It is the official residence of the Kings of Spain though today is only used for state ceremonies. The Palace is the largest royal residence in Europe (yes, even bigger than Buckingham Palace!) and contains almost 3,000 rooms which span a total of 135,000 square meters. The impressive frescoed architecture and sumptuously decorated rooms will have most people drooling (and planning to redecorate when they get home!) as they enjoy an access-all-areas 90 minute guided tour that takes participants through the history of Spain and the lives of its Royal Family as they see how royalty live and how a royal household is run. One of Madrid's top tourist attractions, culture vultures and those who love history, art, stately homes and royalty will thoroughly enjoy this tour. With a friendly tour guide it's a fun tour that everyone is sure to enjoy – There's a room for every member of the family... Art lovers will love the Painting Gallery, the kids will want to check out the armoury, whilst the women are sure to be taking some décor notes as they travel from room to room! Your Experience With Royal Palace of Madrid Skip-the-Line Tour ? Meet your tour guide at the designated location and time and enter the Royal Palace to begin your 90 minute guided tour of the official residence of the kings of Spain as you meander through the halls, rooms and galleries which are all superbly preserved and intricately decorated. Visit the Throne Room and marvel at the stunning painted ceiling, admire the Sabatini Staircase, visit the Royal Armories, the Hall of Alabarderos (the palace guards) and see inside the Official Lounges. The Painting Gallery contains works of art by Caravaggio, Goya, and Sorolla whilst inside the Royal Pharmacy you can see what ailed the royal occupants as you see the real prescriptions handed out to the kings and queens of the past. You'll also get the chance to see inside the Royal Chapel which houses the stringed musical instruments made by the well-known Antonio Stradivari. Learn about the history of Spain and the Spanish Kings from your friendly guide who will tell you all of the facts, stories, and legends that surround both the royalty who resided here and the building itself. Be sure to stop for a moment and enjoy the fantastic city views as your guide takes you through the rooms on the upper levels of the Royal Palace. 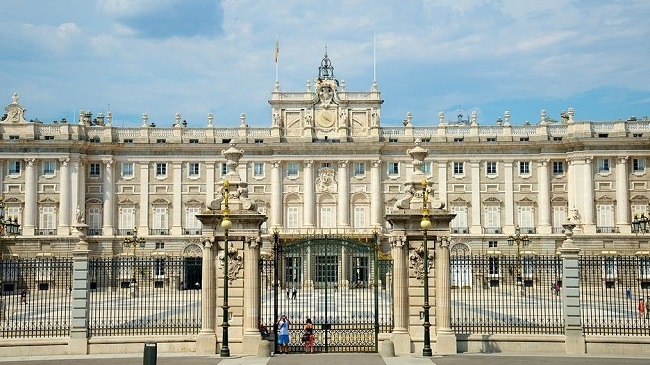 What Royal Palace of Madrid Skip-the-Line Tour Includes? Fast-track entry (skip the ticket office queue) to the Royal Palace in Madrid. A timed-entry 90 minute tour in English and Spanish around the Royal Palace with a friendly and knowledgeable bilingual local guide. Your chance to look inside this huge royal residence and see how the Spanish Kings of history lived! If booking via GetYourGuide you must exchange your booking confirmation for a real ticket before the start of the tour – This could entail queues so arrive early. There is a cloakroom where you can leave your bag/coat plus a cafe and gift shop. Photos are generally not allowed. Travelers Reviews about Royal Palace of Madrid Skip-the-Line Tour ? One TripAdvisor reviewer described the visit by saying 'The decoration inside is astonishing and varies from room to room. It gives you a glance of the great empire Spain once was. The majority of people leave a 4 or 5 star rating saying that it's a very interesting tour given by a nice and knowledgeable guide. Some visitors were unhappy with the queues to get inside the rooms at peak times plus the large groups and also noted that there wasn't enough time to ask questions due to the tours being led in both Spanish and English by the same guide. The Royal Palace is Wheelchair Accessible. Printed tickets and e-tickets are accepted. When booking with GetYourGuide your booking confirmation must be exchanged for an official admission ticket before entering the palace. Be sure to arrive 15 minutes before the scheduled start time to meet your guide. Please note (especially if visiting in the hot Summer months) that the palace operates a smart/casual dress code. Meet your guide at Plaza O?pera, by the statue of Isabel II. Duration: Full-Day, Approximately 10 hours. Duration: 1.5 hours with the actual flamenco show lasting approximately 1 hour.